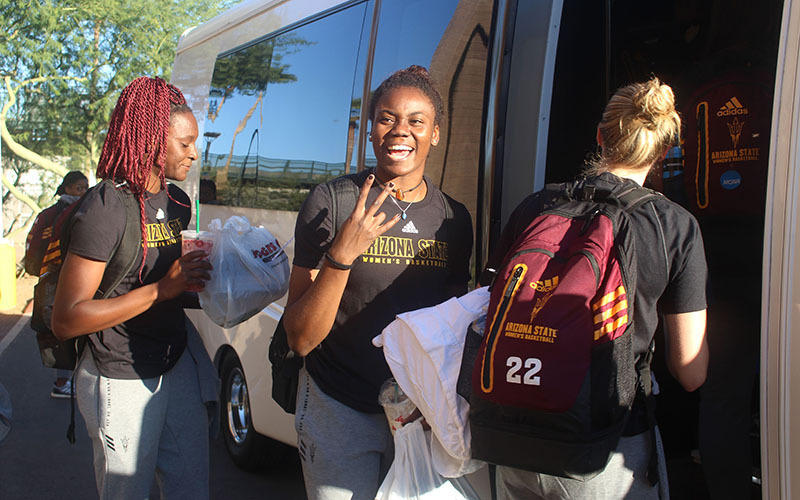 FORT DEFIANCE – Inspired to do more for the Native American community, the Arizona State women’s basketball team will play a game on the Navajo Reservation against the Baylor Lady Bears on Sunday. The game dubbed “Showdown on the Rez” was announced last summer. “The initial idea was to take the game to them,” ASU coach Charli Turner Thorne said. “We always have a game honoring them, but it’s for people in the greater Phoenix area. But what about if we actually went up to the Navajo Reservation? The whole idea was national TV. In previous seasons, ASU women’s basketball has designated a regular-season home game at Wells Fargo Arena to honor Native Americans. Ryan Cohan, director of women’s basketball operations, said Turner Thorne wanted to do something a little bit different this season. Becenti will be one of four former Native American ASU players to be honored at the game Sunday. Another former standout, Michelle Tom, led a coaching clinic Saturday afternoon. Turner Thorne said her former players have been extremely grateful for Arizona State to schedule this game, with some tears shed at the press conference in Fort Defiance over the impact the game will have. Cohan said the search to finding an opponent to play in this game was short. Baylor is no slouch on the hardwood. The Lady Bears are fourth in the Associated Press poll; Arizona State is 23rd. The Lady Bears present an early season challenge for the Sun Devils, but Cohan and Turner Thorne didn’t understate the importance of playing this game on the Navajo Reservation. Despite the result, Turner Thorne thinks the event’s biggest impact will be the stories that are told.